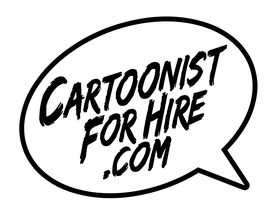 CartoonistForHire.com is the most searched domain for people seeking custom cartoon artwork and writing. This allows us to offer a wide variety of talented cartoonists from around the world, ready to complete your assignment, without you wasting valuable time randomly searching individual sites of individual artists. CartoonistForHire.com allows you to easily browse portfolios by subject and then communicate directly with the artist or writer of your choice to create a custom illustration, comic, or cartoon! got questions about hiring an artist? Curious to see past projects?